The new LPH system employs an LED print head with a beam diameter of only 30 microns, half the size of previous models, making resolutions of 1,200dpi possible. This enables even finer text quality and improved image gradations. In order to enhance the writing accuracy of the 1-chip/8-beam laser used as the light source, the bizhub PRESS C8000 employs an aluminium die-cast laser unit housing and polygon housing which is less affected by the installation environment. To further improve writing accuracy, the main body side adjustment mechanism turns and adjusts the entire print head to keep it constantly parallel with the drum. S.E.A.D. 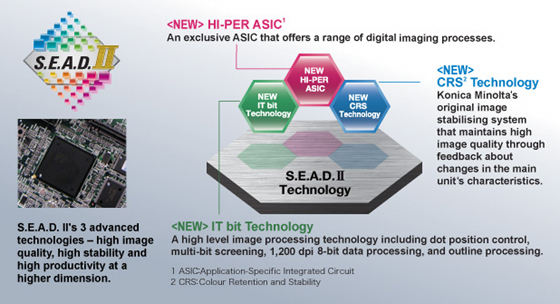 (Screen-Enhancing Active Digital Processing) II is an accumulation of various advanced digital image-processing technologies condensed in a single system – including multi-layer expressions at 8 bits per pixel, and dot position control technology which segments each pixel at 1/256 size – achieving high image quality, and image retention and stability that are nearly equal to offset printing. 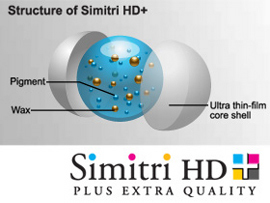 The Simitri HD+ (plus) toner is newly developed for the bizhub PRESS C8000’s high productivity as well as pursuing higher image quality. In addition to providing high speed colour outputs of up to 80 ppm*, as well as low temperature fusing for better productivity for a variety of paper types including thick paper, Simitri HD+ toner provides natural lustrous results similar to offset printing. The bizhub PRESS C8000 and C7000/C6000 offer impressive resolution, made possible by 8-bit multi-layer data processing and an aluminium die-cast laser unit, revealing all the minute details of original data, thereby eliminating the need for offset printing for nearly any print job. Additionally, they provide high-production printouts of RIP-data at 3,600 dpi (equivalent) × 1,200 dpi resolution. The bizhub PRESS C8000’s and C7000/C6000’s 1,200 dpi resolution also results in optimised outline processing for better reproduction of small text and fine lines as well as jagged-free text and graphics. Outline processing improves the appearance of characters by thinning them, reducing blur of white characters and improving contouring. To maintain stable, high quality image results, the IDC sensors monitor CMYK control patches that are created between the images, and feedback on colour density and halftones. By receiving feedback on colour density and halftone dots, the system can automatically make adjustments for more stable output without affecting performance. To maintain stable, high quality image results, the IDC sensors monitor control patches and feedback on colour density and halftones. By receiving feedback on colour density and halftone dots, the system can automatically make adjustments for more stable output. The bizhub PRESS C8000’s and C7000/C6000’s optional Relay Unit’s colour density sensor reads the colour patches printed on the paper and relays the gamma adjustment (gradation correction) values to the print engine, thereby correcting any variation factors during fixing, providing density corrections that match the paper characteristics. The gradation correction values can be set for up to 15 paper categories including, coated, plain, and high quality papers. The new density balance adjustment function for the bizhub PRESS C8000 and C7000/C6000 provides additional density control by adjusting the image. A colour chart is printed and read with a spectrophotometer*. Results are then uploaded to the main unit via USB memory device and stored, significantly improving operation efficiency during registration and setup to achieve excellent consistency. A 256-step fine adjustment function and 32-division density adjustment width are also available for precise density balance control. The bizhub PRO 1200/1051 uses a belt transfer system that improves the quality of paper feeding and images being transferred. Using an electric charge, the gap between the paper and the belt is eliminated. The pressure of the belt ensures that toner is fixed without unevenness for higher consistency. The incidence of image repellence at the paper’s edge and nip resistance, which can cause inaccurate transfers, is also reduced. A high precision duplex registration skew correction is used to enhance image-positioning accuracy for duplex printing. As the skew detecting sensors sense the skew amount after the leading edge of the paper passes the loop rollers, the front and rear loop rollers are driven independently to correct the paper skew during paper feeding, providing high precision registrations for a wide variety of paper types. The highly accurate back-to-front registration of the bizhub PRESS C8000 and C7000/C6000 allows production of high-quality booklets and brochures. 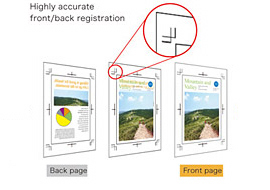 Front edge and skew sensors closely monitor paper position and alignment shift during printing. Any misalignment detected can be precisely corrected via the control panel. Konica Minolta has newly developed an original single pass duplex fusing system to enhance productivity for coated and thick papers, as well as provide a more lustrous finish. For certain paper types, such as thin paper, which do not require second fusing, this process will be bypassed, therefore providing the right fusing needs according paper type. The bizhub PRESS C8000’s and C7000/C6000’s optional Paper Feed Unit utilise an air-suction paper feed unit that blows air from the sides and front so each sheet can be delivered separately. The paper then adheres to the conveyance belt by air suction. This reduces slipping caused by powder on the sheets, and ensures greater stability for high-speed output. The suction strength is automatically adjusted depending on paper type for optimised handling. To prevent paper skew, there are two sensors located parallel to the resist roller (between the resist roller and the drum), measuring the skew angle based on the time gap and linear velocity of paper being transferred and stopping output when paper skew exceeds a pre-set level. Two different types of curl correction are available to prevent paper waving or warping. 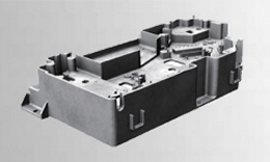 The optional Relay Unit employs a mechanical decurler suitable for both coated and uncoated papers. Decurl strength is adjustable over five steps and in both directions. The optional ICE (Inter-cooler Curl Eliminator) humidifies the paper passage to remove unwanted static electricity and heat from the paper. This reduces the curling and clinging of the paper to realise highly accurate paper delivery when combined with the mechanical decurler. Air is delivered to prevent paper from wrapping around the upper fusing belt, thereby improving the reliability of the fusing unit’s paper feeding. The optional PF-602 Paper Feed Cabinet and LU-202 Large Capacity Unit are equipped with an air-assisted paper feed mechanism. 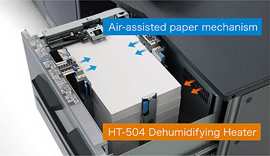 This dramatically reduces mis-feeds by blowing air at constantly changing force and frequency, effectively separating sheets before they are fed into the printer — including coated paper in humid conditions when using the optional HT-503 or HT-504 Dehumidifying Heater. Air flow is automatically applied when printing on coated stock. 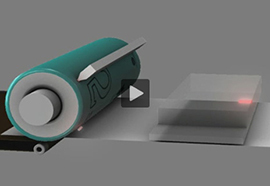 Ultrasonic sensors can detect multi-feeding of papers as they receive fewer ultrasonic waves compared to single sheets of paper. If multi-feeding is detected, printing will automatically stop to reduce printing errors caused by blank sheets being mixed in with the output. The bizhub PRO C65hc combines the advantages of conventional digital printers with the excellent reproduction of RGB. It offers output that is as faithful as possible to the monitor, and is able to reproduce shades previously considered impossible. Our RGB Workflow offers the flexibility to adapt to a wide range of output formats including, paper, Internet, mobile and more. This form of data exchange is best for reproducing the RGB colours on the monitor. It provides accurate RGB to CMYK conversion for printing and RGB to RGB conversion for the Web. RGB photographs, illustrations and other graphics are managed as high, information-dense RGB data until the moment before output. The cyclone-type air suction system features a high-powered dust collector which collects 3 times more toner compared to the previous model. This also reduces the number of replacement frequencies of the filter unit for reduced machine downtime.